A collection of stories and poems from Marco Island Writers, covering a wide breadth of topics both fictional and true. 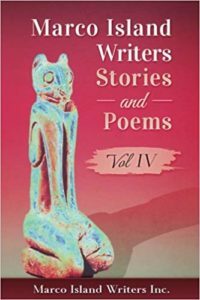 This fourth anthology in the series contains forty-nine original stories and poems. All 4 volumes are available for sale at every Marco Island Writers meeting & at the Marco Island Farmer’s Market [in season]. Members’ price $8.00, non-members $12.00, or a set of all four $29.00. See Pauline for purchase.